Application: Removes rust and stains without polluting. Approved for use by the USDA. 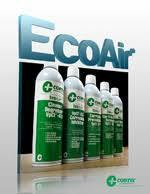 Packaging: EcoAir® products are packaged in 10-14 oz. net wt. (284 – 397 g) recyclable aluminum cans, 12 cans per carton.